You may enter once per post, which means by the end of the month, you could have a maximum of 20 entries. One grand prize winner will be randomly selected from all valid entries and will be given the opportunity to choose from the 20 toys revealed throughout the entire month. Two other winners will also be chosen and may select from the 19 remaining toys. 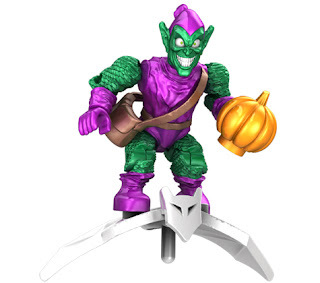 Our twentieth reveal in the "Win What You Want" Giveaway is Green Goblin from Marvel Mega Bloks series 1. 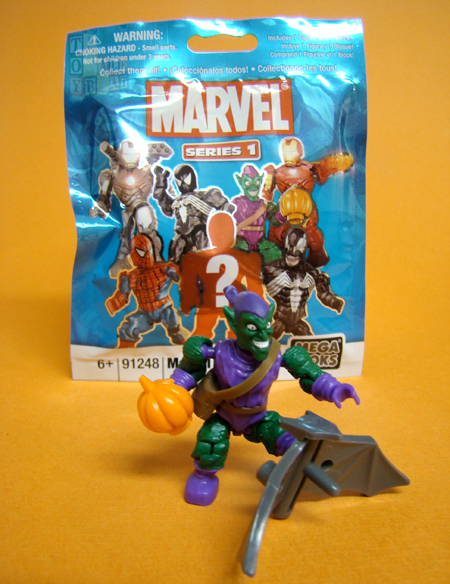 Green Goblin is classified as "Ultra Rare" by Mega Bloks. Although the Marvel Mega Bloks are blind bagged, there is a code printed on the bag that allows you to identify the figures without opening them. Green Goblin is also identifiable by feeling for his giant glider accessory. If you choose Goblin, he will come to you unopened. It will be up to you whether or not he is liberated form his packaging. The phrase of the day for Friday, March 30 is "All I want is your undying loyalty. Or, the dying kind. The Green Goblin is nothing, if flexible..." Post that phrase exactly as it appears here as a comment to this Facebook post and your entry is complete for today.